SILVER SPRING, Md. --- The Pathfinder marching honor is officially a thing of the past. After an exhaustive study by the General Conference-based Biblical Research Institute, GC leaders say that Pathfinder marching leads to dancing later in life. "All these drill moves are simply steps in the inevitable march to gyrating in night clubs," said BRI spokesperson Buzz Keel. He said that he had seen some Pathfinder drill instructors "whip our youth into a frenzy of spinning 'About Faces', salutes and 'Stand Easies' that could give Beyonce a run for her money." Keel claimed that given a smoke machine and a drum track, some Pathfinder marching platoons would fit right in on a Las Vegas dance floor. "Everyone knows that in many parts of the world, Adventist youth nights specifically use organized marching involving prolonged hand-holding and eye contact as a dance substitute to get kids to interact," said Keel. "I hear Prince got his dance moves at an Adventist church social." Why does this site insist on printing FAKE NEWS? Why not tell the truth? Here it is: This morning President Trump finally fired spokesman Sean Spicer after two embarrassing attacks by Melissa McCarthy on SNL. However, this was a moment of rejoicing for G.C. President Ted Wilson, who immediately called Spicer and offered him the position of G.C. Spokesman. “He is exactly what we need to put forth ‘alternative facts’ [lies] about ordination,” said Wilson. “Who else could be so skillful at explaining why we banned women’s ordination when the Bible clearly says it’s okay?” In other news: the CIA has discovered that Trump is a Russian KGB agent, and Wilson is a Jesuit — which explains a lot of things that are going on. 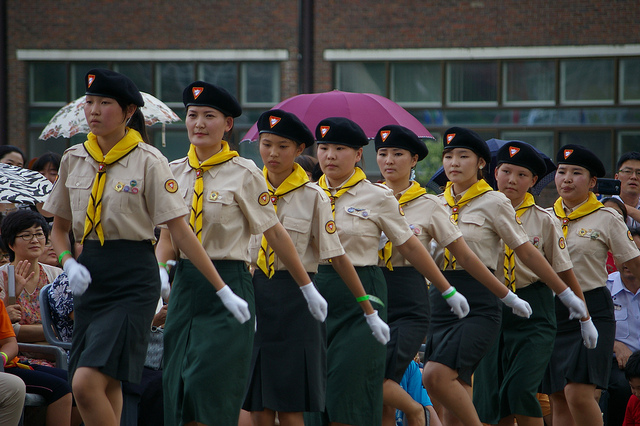 PHOTO: ARE THESE WOMEN IN PATHFINDERS? OR ARE THEY IN THE NORTH KOREAN WOMEN’S ARMY? It’s about time to eliminate this so called “marching ” honor. The next honor to go is the drum corps honor. It serves no useful purpose. Haven’t you all read in Selected Messages about drums? They are sinful, demonic, satanic, heathen ritualistic, stirs up the inner passions, lustful, anti-Biblical and all that stuff. I just tore up my marching honor and burned it in the wood stove. On this Sabbath, I’m gonna spread the ashes all over the parking lot at church as a symbol of freedom, my frustrations have been released. I am HEALED!! Is there a hearty AMEN out there? Say, GLORY!! Richard, you and Ted are both Jesuits. I can tell by the way you write. And if you deny it, that will just prove the point–because Jesuits always deny it. And if you deny that you’re crazy, that will just prove that you are. Because crazy people always deny it. i find the reference to las vegas offiensive — i live here and depend on the happenings here to keep me alive and support the needy. I recall some marches we did as PF similar to twerking — what gives. The converted natives in africa, asia and polynesia twerk in their own way. Go thou and do likewise (twerk like the PF and converted natives). Sevvy must be losing it. How could he forget Valentines Day and the annual jab at Carob “chocolates”? Poor guy. Must be too busy moonlighting as a banker, stockbroker, or advertising executive. By the way, for the record, I like carob. No matter what anybody else says, it’s yummy. I thought I had overcome my addiction to reading Barely Adventist. But I had a relapse. Whoops, gotta go. The Wife is calling 911. Yo, Bro-Sum Ting-Yes, Sum, there is a Jesuit. He is real, He lives among us. His spirit is all over the place. Right now you can’t tell who is real and who is not real. Only the Angel with the scythe knows. By the way, Sum-I know your twin-Sum Ting White. Will someone please shout out an AMEN! Is there sum won reddy to be saved? Shout praises, Brother. Stand up and be HEALED from demons & spirits and have fun with satire!! Adventists have their “Amazing Facts.” BarelyAdventists have their Alternative Facts (lies).